Pinto horses, which may be known as paint horses or coloured horses (especially in the UK), have a pattern of patches of white hair over un-pigmented (pink) skin, which can occur with any coat color ('pinto' means mottled or pied). 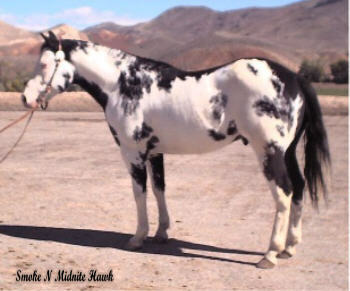 In the UK pinto horses were traditionally described as piebald or skewbald, depending on whether they were black and white or colored and white respectively. This tradition is still commonly used among UK horse owners, especially those who are riders than rather breeders. In some places bay patterned horses are traditionally known as "tricolor horses". Nevertheless there is now a trend to replace these terms with more accurate descriptions that convey information about the genetic inheritance and phenotype (i.e. external appearance) of the different types of patterned horses. Pinto horses may have one or more of the genes for tobiano, sabino , splashed white or overo patterning. In the case of sabino there seems to be at least two genes causing the pattern so that pintos must have the appropriate genotype at both the genes. For the other patterns the pattern allele is dominant over the wildtype allele so that possession of one pattern allele at any of the genes can be enough to cause a pinto pattern. Many paint horses have more than one pattern from a genetic point of view. Pinto may also be combined with other kinds of pattern, such as gray, roan and even appaloosa (sometimes called pintaloosa). Pinto horses occur in many horse and pony breeds and their flashy appearance has made them traditionally popular, for example as circus and gypsy horses. When patterned horses are bred together various outcomes can result depending on the pattern and genetic make-up of each parent. Unless at least one parent is homozygous for one of the pinto genes there's no guarantee of a pinto foal. The allele that causes the overo pattern is lethal when homozygous, and one shouldn’t knowingly breed together two horses with this pattern. The pinto patterns show huge variation in the amount of white, from being almost totally white to almost completely colored. Tobianos are almost always obviously pinto horses even when there is only one spot of white, which is often around the tail or mixed in with the mane. However overos, and especially sabinos, may look like solid with a stray white marking or even just some roaning. One pinto pattern of particular note is called the medicine hat. Ideally a medicine hat is completely white except for a "hat" of color over its ears and forehead. However, paint horses with the obvious "hat" markings and other patches of color are often labelled as being medicine hats. Horses with this pattern were cherished by American Indians, who thought they were sacred. Sometimes paint horses are almost entirely white. It seems likely that these are the horses previously thought to be carrying by the "Dominant White" gene (W). In fact they are sabino horses showing the extreme form of sabino white. This is supported by the fact that some horses who were supposed to be Dominant White didn't have a Dominant White parent (the parent the gene was inherited from should’ve also been Dominant White!). It is more likely that "Dominant White" horses born of non-white parents are really sabino horses with the maximum expression of the pattern. The Dominant White gene was thought to be lethal when homozygous. Sabino, however, is not lethal when homozygous: Clydesdales and Shires are exclusively Sabino and many horses of those breeds are sure to be homozygous for the sabino allele. In the United States, there are two major registries for paint horses and various minor ones (in terms of the number of registered horses). These are the American Paint Horse Association (APHA) and the Pinto Horse Association of America (PtHA). The PtHA allows for the registration of pinto horses and ponies of many breeds, but not draft horses and ponies, which have their own registries.